Summit-Cope was designed for modularity with value and aesthetics in mind. The basic pieces are offered both KD (flat pack, needs assembly) and assembled. Included are components that work with the case good shells allowing you to configure a variety of units suited to your needs. The finish is Sunset Cherry and features radius coped edge with curved nickel hardware. Consists of wood, cherry veneers and other wood product. Tops are 1.5" inch thick with coped edge. It has a cherry finish on book matched cherry veneer with a polyurethane top coat. Substrate material is solid chip core. The collection features Camlock construction with reinforcement connectors for maxium stability. Drawers feature five sided dovetail construction with cherry veneer facings with internal wood rims on a particle board core. All drawers have fully extending, metal roller bearing, heavy duty suspensions. Box drawers have a 60lb. to 70lb. load bearing rating, file drawers have a load bearing rating of 150lbs. File drawers are equipped with heavy guage metal rods for letter or legal sized hanging folders with front-to-back or side-to-side filing capabilities. 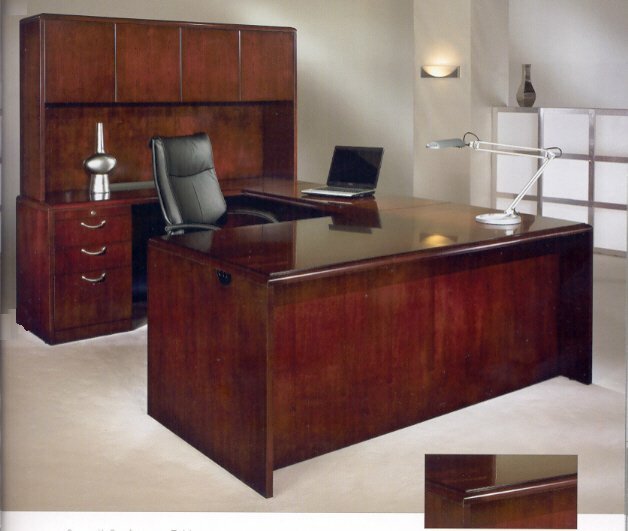 All desks, file cabinets, and credenzas have adjustable levelers. Knock down version available. Pedestals are assembled, modesty panels and tops need to be attached. All hardware comes included. not all pieces are available KD. Felt lined box with a pencil tray/box drawer with removable divider/file drawer per pedestal. Locking pedestals. Grommet in each end panel. Felt lined box with a pencil tray and removable divider/file drawer per pedestal. Locking pedestals. Grommet in each end panel. Felt lined box with a pencil tray/box drawer with removable divider/file drawer per pedestal. Locking pedestals. Grommet in back panel. Two cabinet with an adjustable shelf. Felt lined box with a pencil tray with a removable divider/boxith a removable divider/file drawer per pedestal. Grommet in back panel. Felt lined box with a pencil tray/box drawer with removable divider/file drawer locking pedestal. Grommet in back panel. Felt lined box with a pencil tray and removable divider/file drawer. Locking pedestal. Grommet in back panel. Felt lined box with a pencil tray/box drawer with removable divider/file drawer. Locking pedestal. Grommet in back panel. Felt lined box drawer with a pencil tray/box drawer with removable divider/file drawer. Locking pedestal. Grommet in back panel. Two lateral file drawers. Locking pedestals. Grommet in back panel. Personal file/felt lined box with a pencil tray/box with a removable divider/lateral file drawer. drawers. Locking pedestals. Grommet in back panel. Felt lined box with a pencil tray/box drawer with removable divider/file drawer per pedestal. Grommets on top. Two file drawers. Central locking. Equipped with an anti-yip device. Two cabinets; letter storage; cable accesible; 24" vertical clearance from bottom of storage trays. Frosted glass door panels. Two cabinets; letter storage; cable accesible; 24" vertical clearance from bottom of storage trays. Two cabinets. can be hung directly on the wall or between two storage cabinets. Four adjustable shelves; metal coat rod. Two adjustable shelves; two lateral file drawers with central locking; cable acessible.